Luciano Pavarotti (12 October 1935 - 6 September 2007), an Italian tenor, was one of the most famous singers, not only in the world of opera, but across all genres. He was born in Modena to the family of a baker. 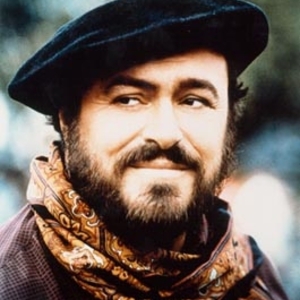 After abandoning the dream to become a professional football goalkeeper, Pavarotti spent seven years in vocal training and began his career as a tenor in 1961 in Italy. He sang in houses in The Netherlands, Vienna, London, Ankara, Budapest and Barcelona. By the mid-1970's, the tenor became known worldwide, famed for the brilliance and beauty of his tone, especially into the upper register. His "high C" became one of his trademarks. The late 1970s and 1980s saw Pavarotti making significant appearances in the world's opera houses and establishing himself as one of the great singers of the era. Popular stardom came at the 1990 World Cup in Italy with the performances of "Nessun Dorma" (from Turandot) and as one of The Three Tenors in their famed first concert held on the eve of the final match of the tournament (repeated at later Cups). Pavarotti sang together with fellow star tenors Pl?cido Domingo and Jos? Carreras and brought to the much wider audience hits previously confined to the opera world. Appearances in advertisements and with pop icons in concerts around the world furthered his influence. Pavarotti always maintained his identity as an opera star, unlike many crossover artists.